Stop eating out or getting delivery services: Eating in restaurants or ordering delivery can be a big money leak. Try to avoid this practice when you are on a budget, purchase all of your food from the store and cook it in your home. You will see that the savings will be considerable and at the same time, you will be watching more closely what your family eats. Looking up recipes ahead of time is a good way to make this task easier. Pinterest is a great resource for family-friendly recipes. Do your grocery shopping consciously: Before you jump in the car and head to the supermarket, take a look in your refrigerator and pantry and see what you already have. Then go to the store and explore every aisle. Look for products that can complement the ones that you already have. That way, you will be taking advantage of everything you have on hand and you will be saving money by not buying what is already available at home. Go to the store once or twice a week: Visiting the store often will make you buy unnecessary things. This is because you won’t feel like you are paying a big bill everytime you go. If you go once or twice a week, you will see that you will purchase only the essentials and will still have a hefty grocery bill. This will stop you from buying those sodas, cookies, and chips that you don’t really need. Stock on bargain priced products: If you see a product that your family likes, it is on discount and your budget allows you to stock up, go ahead and get a few! This is recommended with canned and boxed items that don’t expire anytime soon. If you have the freezer space to stock up on meat, make sure to buy it frozen and seal it very well, so it doesn’t lose its nutrients. A good investment to help you with this is a vacuum sealer. 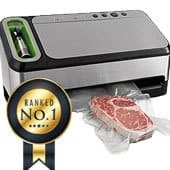 If you don’t know anything about them, you can search for the best vacuum sealer review and get an idea of how useful it is and which one is the best. Make a meal plan: Having a meal plan will help you to maintain more control over the cost of your grocery bill. This is because you will always know what you are looking for and you won’t end up buying whatever crosses your path. Create a meal plan and a list of what you need before you head to the store. Using recipes that have similar ingredients is a great way to save on costs.